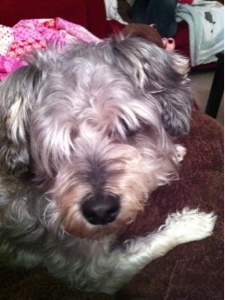 Life at Pemberley: Shaggy Schnoodle! Today is your lucky day! 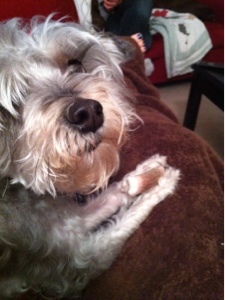 It's Gratuitous Schnoodle Picture Day! In paying off the last bit of our debt last week, we had a heart-to-heart with Scouty that if we have to sacrifice, then so does she. To that end, the poor thing is ridiculously uncomfortable in her own fur, which she can't get rid of for another week (Grooming is expensive!) and of course it's finally warm and sunny outside. We keep trying to keep the hair out of her eyes, but the poor thing just can't help herself. Extra baths since she's getting corn-chippy-smelling faster (Did you know Schnoodles smell like Fritos when they're dirty? You'd think that would be a good thing and you'd want to eat her, but no, it's a very strong corn chippy kind of smell and it's terrible!). We're all three counting down the days until her grooming appointment. But sacrifices had to be made. Haha! Please stop singing, Mama! I'm giving you The Look but you can't see it. The One Thing I Can't Stand! Chickpea Basil & Tomato Salad: PinterTested!